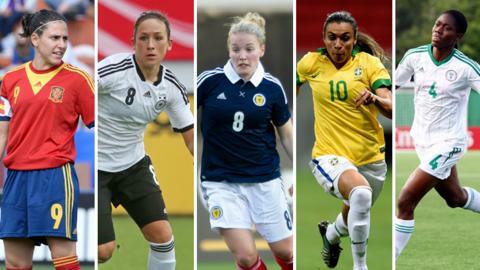 BBC World Service has revealed the five names in contention for its inaugural Women's Footballer of the Year award. Spain's Veronica Boquete, Germany's Nadine Kessler and Scotland's Kim Little are joined by Brazilian forward Marta and Liverpool and Nigerian youngster Asisat Oshoala. The winner will be revealed on BBC World Service on 26 May after being decided by a public vote. Voting is open now and closes on 11 May at 10:00 BST. A panel of experts - including administrators, journalists, coaches and former players - decided the shortlist. Fans can vote online through the BBC website or by SMS. To vote for BBC Women's Footballer of the Year 2015 by SMS, text the number of the player you wish to vote for to +44 7786 20 20 04. Text 1 for Veronica Boquete, 2 for Nadine Kessler, 3 for Kim Little, 4 for Marta and 5 for Asisat Oshoala. Mary Hockaday, Controller of BBC World Service English, said: "With anticipation building ahead of the Women's World Cup in Canada in June we're thrilled to announce the shortlist for the first BBC Women's Footballer of the Year award. "The five shortlisted players represent the creme de la creme of female footballers from across the globe." Spanish midfielder Boquetetold the BBC: "I'm really, really happy to be shortlisted. To have all the media talking about this award is really important to help our sport grow." 2013 European Championship winner Kessleradded: "I am very honoured to be nominated for the BBC Women's Footballer of the Year Award. It is a special award because this time the fans are given the opportunity to vote for the players." Little, who plays for Seattle Reign in the United States, said: "Considering the competitiveness and the amount of great players there are worldwide, it's extremely nice to be recognised." Marta, a World Cup runner-up, said: "I feel very happy to be nominated and already feel victorious just for being in the final five. It's very special because you are being judged by the public, the people who follow you." And Oshoalasaid: "I worked hard last year but I am surprised to be nominated and I feel very appreciated. This award is a very good thing for women's football. It can really help us by encouraging other countries to support their ladies more and treat them the same way they treat the men." Listen to the nominees announced on Canada Calling.